March 1991. I was a normal 6 year old little girl. Healthy and care-free (apart from when my little sister annoyed me… which was often! ), my little life was perfect. Then, for no apparent reason, I started to wet the bed, I was constantly thirsty, so thirsty that I wasn’t bothered in the slightest when my mum banned me from drinking juice, giving me water instead and I started losing weight from my already tiny frame. My mother took me to my GP, who concluded I was suffering from a water infection & prescribed antibiotics. By chance, as we were leaving, my mother got talking to one of the practice nurses, who suspected that there was more to it than a simple water infection. She popped into her office to get a blood glucose monitor & tested my sugar level, which showed a number way off the scale for a healthy person! My memory of what happened next is a bit of a blur. I remember the Doctor mention the word “Hospital” and I cried because I didn’t want to go there, a scary place for a 6 year old! Arriving home, my mum told me to pack some toys, I remember packing my favourite Barbie doll. Next, an ambulance arrived outside to take me to hospital, where I was diagnosed with Type 1 Diabetes, or Juvenile Diabetes as its sometimes called. Again I don’t remember much about my hospital stay, other than my mum having to learn how to draw insulin from a glass bottle into a syringe and inject it into an orange… and then into me… We weren’t allowed to leave until she had learned how to take care of me. My little sister went to stay with my Grandparents. Looking back as a mum now myself, I can’t imagine how she must have felt having to do this to her little girls, having to put one through daily pain & feeling like she’d abandoned the other! At 25 years old, she was only a young girl herself, it must have been such a hard time for her! I remember my Nana visiting me in hospital, bringing with her the sparkliest pair of slippers I’d ever seen, bright pink with silver stars. I felt like a Ballerina Princess! Sadly, this would be the last time I remember seeing my Nana as she passed away not long after, but I will always treasure my final memory of her. 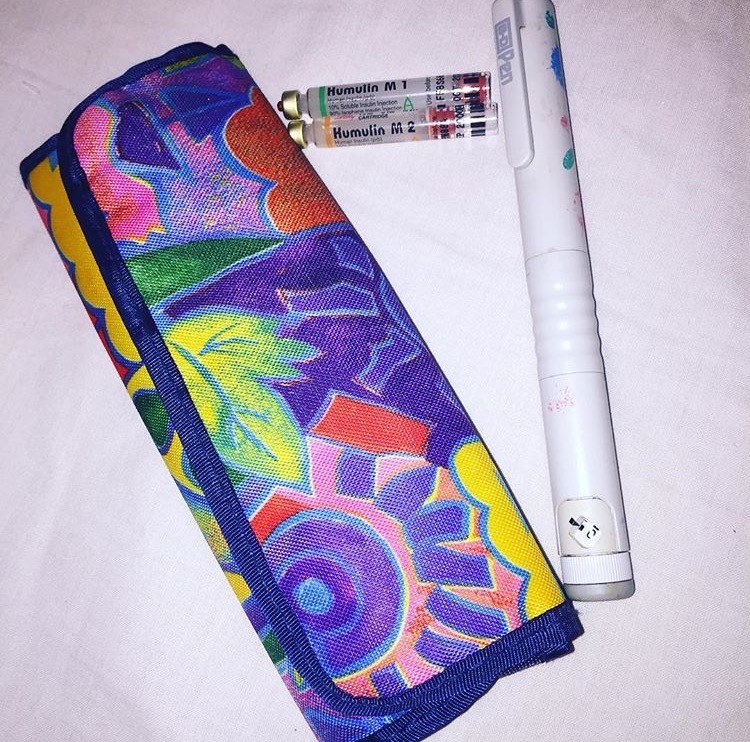 Adjusting to Diabetic life was pretty easy… My mum made me food, and I ate it. If I wanted something I couldn’t eat, I accepted I couldn’t have it,and that was that, no questions asked. As a single mum herself, she could rarely afford to buy us treats, but when she did I was quite happy with a packet of Salt & Shake Crisps. I don’t remember ever being bothered by having to be injected twice a day & my little friends looked on in amazement when my mum pricked my fingers! And then I started high school. My mother gave me some freedom and started to let me test and inject myself. Aged 11 years old, I started to rebel in my head. I was quiet & self conscious, and I just wanted to fit in and be like the other girls and this meant eating whatever they ate – chocolates, cakes, crisps, you name it! Food seemed to be everywhere I went! I even worked out a way to manipulate my glucose meter into giving me the results I wanted so that my mother wouldn’t suspect that I’d spent most of the day eating junk food. Things got even worse as I reached my late teens. I was introduced to alcohol and nights out. I still wanted to be just like my friends, and my personal motto became “Anything you can do, I can do better”. I ate & drunk what I wanted, when I wanted. I never skipped an injection, but as I was on set doses, I simply wasn’t getting enough insulin to cover all the carbs I would consume. Eventually, testing my glucose levels just wasn’t an option. I didn’t want to look like the odd ball of the group. So I made my numbers up before each clinic appointment. A tiny voice in my head told me I was slowly killing myself, but I ignored it. Not even the horror stories of feet amputations, kidney dialysis and blindness put me off. I was in denial. I just wanted to be normal. I tuned out at every appointment, I nodded my head in all the right places, but in actual fact I was totally overwhelmed by this unfair life sentence that was hanging over me. I was invited to attend numerous DAFNE courses (Dose Adjustment For Normal Eating), but I didn’t understand its purpose, besides, I was too busy. Life & work always, coincidentally, got in the way. I was admitted to hospital with DKA at the age of 22, and on discharge, was sternly told to “keep better control”. I’d love to say I listened but I didn’t know how to manage it. And I didn’t know who or where or how to ask for help. So I carried on. Told myself “You only live once, may as well enjoy it while I can”. A turning point came when I found out I was expecting my baby. Suddenly I had support on tap, people telling me what I needed to do & how much insulin to inject at every meal, coupled with the realisation that I had another being relying on me to keep him or her safe, healthy and alive. My control was spot on for the duration of my pregnancy. After the birth of my daughter, the baby weight fell off me, plus an extra 14lbs, and I felt good about myself for the first time in forever! I managed to keep up the good work, but then her Dad & I separated and I started to struggle again. My subconscious told me to pull myself together, sort my head out & start looking after myself for her sake. She needed her mummy. But I struggled to juggle my condition with being a single working mother. I was shocked when I received my terrible hba1c result last year. Although I’d always had poor control over my condition, I’d always managed to maintain a hba1c of around 8%, which wasn’t good, but wasn’t bad either. My doctor prescribed me Metformin but I was reluctant I needed it, I knew I just needed to drastically change my lifestyle. Something just clicked in my head. I started doing some major research, joined a gazillion social media support groups, and I quickly worked out I needed to Carb Count. I taught myself before I was once again invited to attend a DAFNE course, and this time I said yes! Hands down, without a shadow of a doubt, the best decision I have ever made! I started eating healthier, less carbs, more protein. I joined a gym and found a personal trainer to push me. I feel so much better in myself, healthier! I even started to test my sugar levels again, so much so that I’m now slightly obsessed, I test myself on average at least 12 times a day! On April 4th of this year, I was ecstatic to learn that my hba1c had come down to a good 7% (my goal is 6.5%), and I fit the criteria to try insulin pump therapy due to suffering regular night time hypos. I’m seeing this as a new chapter in my diabetes story & I’ve learned to embrace my condition instead of hiding it away. Unfortunately, I’d love to say that all those years I spent abusing my body hasn’t affected me. Recently a leakage has been discovered in one of the blood vessels behind my left eye. It hasn’t had any effect on my eye sight yet, touch wood, but there is a chance. I have quarterly eye checks and need to ensure my glucose levels are perfect. If the leakage gets any worse, the next step is laser treatment to try to close the vessel & stop the leak. Fortunately, I’m a naturally optimistic person & always look for the silver lining in every cloud. I’m just thankful that, for the time being, that is the only complication I’ve suffered. Through my research, I believe I suffered some form of Diabetes Burn Out for all those years. I don’t believe I’m the only diabetic to feel the way I felt; if you can identify with my story in any way, I strongly urge you to go and speak to your Diabetes team, so that they can help you. I’m finally at peace with myself, at a place in my head where I no longer feel burdened by my condition. I’ve learned to embrace it instead of hiding it away. I spent all those wasted years in denial and rebellion, but finally I’ve come to realise that “anything my friends do, I can 100% do better”, I just have to do it a different way! I can completely relate to your teen years. I had a hard time accepting that I had a health condition, and I wanted to be like everyone else. My turning point was also my kids. It was no longer just about myself. I had a human being to protect. It’s hard being diabetic no matter the age. But what I’ve learned from this disease is that you have control over the diabetes. Diabetes doesn’t control you. I totally agree with you Brittany, it’s taken me this past year to realise that! But we have eventually gotten there and that’s the main thing! I’m glad to hear you’ve found peace with this condition. Thank you for teaching us so much about type 1 diabetes. I never knew any of that. Good going on getting yourself healthy again. I really is a choice isn’t it/ For all of us. I love how candid and open you are here. So many people live with this – and while I feel they want answers and tips, I think that what most of us desire when we deal with certain things is simply someone who understands and can relate. We like to experience familiarity in the struggles of another – not because misery loves company, but to feel less alone. I think you’ve done a beautiful job here – and expressed hope and empowerment. Thank you for your great comment Dana 😊 You’re right, I often felt alone dealing with this condition, even after I joined some fabulous social media support groups, I still struggled to find other people who found it difficult too. Maybe, like me, they felt embarrassed at not being able to control it, or in denial, or simply didn’t know how to ask for help. My aim when writing this was to show that it’s normal to feel like this, but that there is light at the end of the tunnel and you can get through it. If just one person reads this post and decides to ask for help, I will be happy to have achieved my aim. Great first blog post. I don’t have diabetes, I found your blog via Blogging Anarchy and as a newbie myself I wanted to see how others write especially new bloggers. I loved your childhood memories and feel like I understand diabetes better. Nice. Thank you for sharing. You made an excellent decision for yourself and your daughter to take control of your diabetes. I remember the terror of my single Mum having hypos when I was a little girl and having to call ambulances on a regular basis. I still get a fright every time I phone my Mum and she doesn’t answer the phone. I am grateful to her for being careful with her management (much easier for her with the pump than it was with pig insulin and a bunsen burner when I was little). Best of luck to you.